There are certain rare configurations that can cause an unpredictable behavior of the software. To cater for this we have developed a special message dialog box which permits a more accurate examination of the problem. If such an exception occurs in your installation, there are various ways to inform us about it. These options are described below. This dialog box allows our developers to localize an unpredicted condition more precisely and make future versions of InLoox more stable. Click Details in the dialog box. All the exception data that the system has compiled are displayed. Click To Mainpage, if you want to proceed with the work. You can, of course, also contact our support directly in the usual way. Please make sure to have the contents of the exception dialog box to hand. For more information on how to contact the InLoox support team, please see Contact the InLoox PM Web App support. 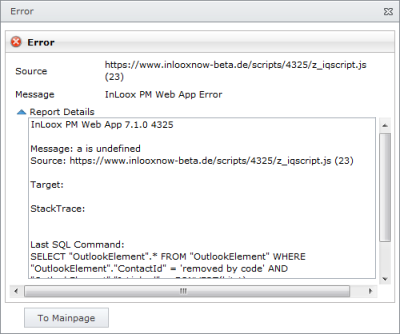 How to Report Exceptions in Inloox PM 7 Web App • Copyright 1999-2019 © InLoox GmbH. Reservados todos los derechos.